As the industry leader in window coverings, Hunter Douglas is constantly looking for new ways to improve its products to solve everyday challenges. From making your home more energy efficient to finding new solutions for improved privacy and light control or the latest hi-tech solutions for added safety and convenience, Hunter Douglas is always developing products that deliver beauty and style with exceptional value and features to make your choice in window treatments easier than ever. Here we’ll introduce the latest premium shades from Hunter Douglas. Back in 1985, the world was dealing with a global energy crisis. In light of this crisis, Hunter Douglas recognized the need for energy efficient window treatments and introduced the first honeycomb shade. Duette® is the latest redesign of the honeycomb shade from Hunter Douglas. Duette® incorporates style with the latest in energy efficiency to give you a beautiful custom shade that will help reduce potential home energy loss and help to lower home energy costs. Duette® is offered in a wide array of color and fabric options. Available operating features include Top Down/Bottom Up and Vertiglide™, to help make your life more convenient. A new spin on energy efficient window treatments, Sonnette™ combines the energy saving elements of a honeycomb shade with the simplicity of a roller shade, Sonnette™ is a cordless roller shade, which is ideal for households with small children or pets where safety is a concern. Available operating systems include the innovative PowerView® Motorization system, which allows you to operate your custom shades from the Pebble Remote Control or from your smart device using the PowerView® App. Another option is SoftTouch™ Motorization, where operation is as simple as tapping a wand. Sonnette™ shades are available in a wide array of colors and fabrics, to suit your desired look and light control needs. If bright sunlight makes some rooms in your home unbearable during the day, Silhouette® is a great option. As the gold standard for light diffusing shades, Silhouette filters harsh sunlight to create a soft, warm glow. Featuring vanes of fabric floating between two intelligently designed sheer panels, they preserve the view to the outside and obscure the view inside to protect your privacy. Just tilt the vanes to find your desired amount of privacy or natural light. Silhouette ClearView™ Shadings, the newest innovation from Hunter Douglas, provides maximized view-through using a unique combination of front and back sheers to make the most of your view. Roman shades are a great option for any room in your home and complement any style. Vignette® Modern Roman Shades are available in virtually any color, fabric, and fold sizes. Depending on the type of fabric you choose, they’re an excellent option for blocking out light, absorbing sound and adding an elegant flair to your home. Vignette® Modern Roman Shades are available in three styles, Traditional™, Tiered™ and Traversed™, and are completely customizable to suit your needs, including vertical installation, ideal for sliding glass doors and the Top Down/Bottom Up option for maximizing privacy and light control. For a new take on roman shades, consider Solera® Soft Shades. Solera® is a combination of the classic roman shade and modern honeycomb shades. 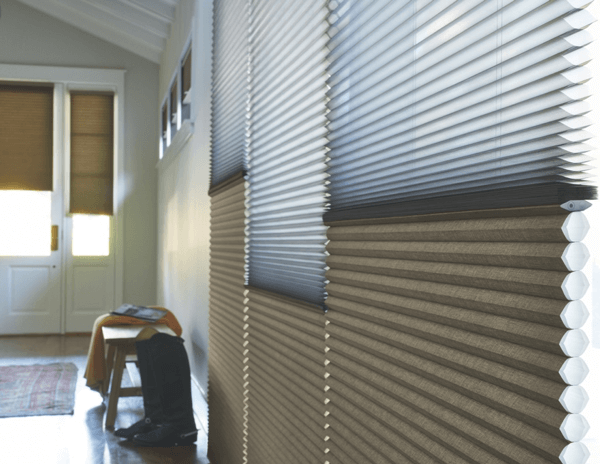 Due to its unique construction, Solera® gives your home the insulating, energy efficient benefits of a honeycomb shade while also giving you all the simplicity, style and customization options of a roman shade. These are just some of the featured custom shades offered by Hunter Douglas. As you can see, Hunter Douglas shades are consistently the industry leaders. For superior energy efficiency, privacy and light control or light diffusion methods, Hunter Douglas custom shades are superior to the competition. Call A Shade Above today! Our team of knowledgeable professionals can answer all of your questions when it comes to window treatments. From design to final installation and every step in between, we’re your one stop shop. Call or visit either one of our state of the art showrooms, located in Charlotte, NC and Cornelius, NC and see, feel and operate the latest full-size samples from Hunter Douglas. Proudly serving the greater Charlotte area, call us today to get started on your next home improvement project!